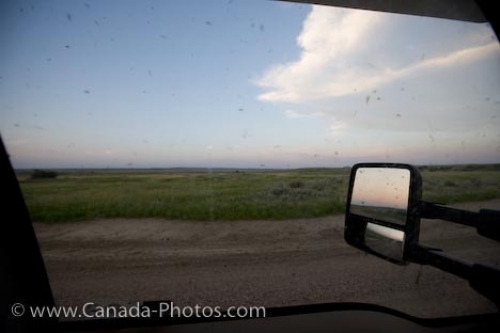 Looking out a truck window while stopped on a gravel road along the Frenchman River Valley Ecotour in Grasslands National Park in Saskatchewan, Canada, hundreds of mosquitoes can be seen. The Frenchman River Valley Ecotour in the West Block of Grasslands National Park in Saskatchewan, Canada is a beautiful scenic drive except at certain times of the year when the mosquitoes are out. While stopped at the side of the road, one can see the hundreds of mosquitoes outside the window of the truck. In Saskatchewan, there have been seventeen species of mosquitoes which are known to carry the West Nile virus in other regions around the world, but only a few of them have a high possibility of transmitting it. It is unlikely that this mass of mosquitoes in Grasslands National Park carry the virus, but who wants to get out of the vehicle with them and be covered in bites. Picture of hundreds of mosquitoes outside a truck window in Grasslands National Park in Saskatchewan, Canada.